A curated series of Academy Award films from four categories: Best Picture, Foreign Language Film, Animated Feature, and Documentary Feature. 11 Oscar-nominated feature films, over three weeks with a final marathon encore on Oscar weekend. 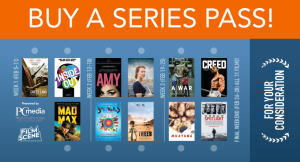 See them all with a series pass, or buy tickets individually.